What Can Brown Do for the Phillies? 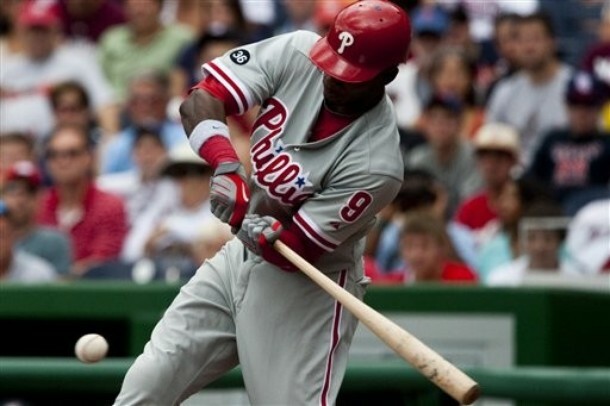 After spending the first month of the season at Triple A Lehigh-Valley, Phillies outfielder Domonic Brown is back with the big league ball club, looking to provide a much-needed spark for an anemic Phillies offensive attack that’s had trouble scoring runs. Brown was able to come back to the Phillies after centerfielder Shane Victorino went on the 15-day disabled list and because he tearing up minor league pitching at Lehigh Valley. He batted .341 with 10 runs batted in and two home runs. He also had a .537 slugging percentage and a .437 on-base percentage. While was Phillies management was initially worried about to bring him up too soon, but with Victorino injured, Brown re-joined the parent ball club last Friday. The main challenge that Brown faces is just getting time on the field and finding his comfort zone as a hitter. Brown got his first RBI of the season on a sacrifice fly in the bottom of the second inning in Tuesday’s 6-3 loss to the Cincinnati Reds. In the Phillies 10-3 win over the Reds he was 1-for-4 with a double.In the Phillies 2-0 shutout of the Texas Rangers last Saturday, Brown was 0-for-4. For the last year, the 23-year-old Brown has accumulated a number of accolades since being picked in the 20th round of June 2006 draft as a high school player out of Redan High School in Stone Mountain, Ga. In 2009, the magazine, “Baseball America” named him the top prospect in the Phillies minor league system. Last season, Brown started out the season at Double-A Reading and had a .381 batting average over an 11-game stretch until he was promoted to Lehigh Valley. On July 28, Brown got moved up to the Phillies. He was a recipient of the Paul Owens Award as the best minor league player in the Phillies farm system. sustained an injury to his wrist and was out for 4-6 weeks. He got his first hit of the spring the day he got injured. Gross said Brown has good hand and eye coordination and has fared well against some good competition in the minor leagues including hard-throwing Reds left-hander Aroldis Chapman, whose fastball has been clocked at over 100 miles per hour. For right now, Phillies manager Charlie Manuel is platooning Brown against right-handed pitching and will eventually test him against left-handed pitching. In 2010, Brown struggled against lefthanders, he was 2-for-18 (.111 batting average). Brown said it was tough when he first came up here last year because he wasn’t used to coming off the bench as a pinch hitter, but this season as a starter against right-handed pitching. “I’m back to my normal routine and back to doing the things that I do. It’s just going to take time and I’m not going to put any pressure on myself or anything like that. I’m just going out and having fun,” Brown said. The tall, lanky Brown has the potential to be a five-tool player with his speed on the base paths and in the field. He has a strong arm capable of gunning down runners from right field. He said defense and hitting are his favorite aspects of the game.